Although posted letters and cards have been largely replaced by digital communications such as emails, SNSs and text messages, cute postage stamps might motivate you to pick up a pen again. When you come to Japan, check out the Japanese stamps sold at the Japan Post. You might find some kawaii stuff there! 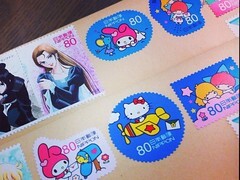 Every month, Japan Post issues stamp sheets with new designs. Usually one sheet comes with 10 stamps. They offer a wide variety of designs from pictures of historical sites of Japan to popular anime characters. 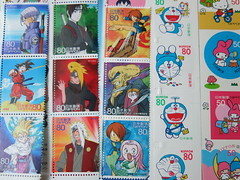 In the past, they have issued stamps of manga and anime that are popular both home and abroad like “Doraemon” (2013), “Dragon Ball” (2012), “One Piece” (2011), and more. Wouldn’t be exciting to receive a letter with such unique stamps?! You can purchase stamps at all post offices located throughout Japan. You can check the rate from the Japan Post website.